But will it also make calls? A new rumour suggests that Asus is planning to put out an ultra slim slab that will put all others to shame. 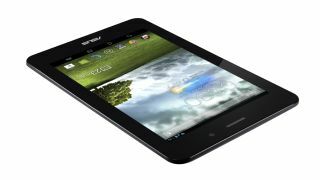 The tablet that Asus is said to be planning will be 6mm thin, which would make it slimmer than the 8.2mm Windows-running Samsung Ativ Tab 3 and the 6.9mm Android-packing Sony Xperia Tablet Z. This means that if it actually exists, the new Asus tablet would be the thinnest on the market, assuming no one pips it to the post. Is it a tablet… or is it a load of nonsense? But with actual information thin on the ground, this could also be nothing more than the weird fever dreams of an Asus super fan. There's not even a mention of whether it will be running Android or Windows. And let's not forget that something that thin is surely going to be more prone to breakages - not exactly something you can just toss in your bag. But TechRadar loves a bit of action from Asus chairman Jonney Shih and, if this super thin tablet rumour is true, we can't wait to see what he cooks up for his big announcement speech.